Bring a piece of Middle Earth into your home with one of these must-have LOTR chess sets. 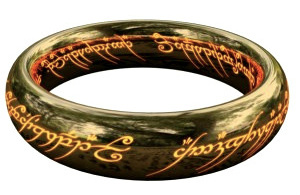 The Lord of the Rings is a popular story that has endured for decades, whether it be in book form or on the big screen. It has millions of fans across the world, both young and old. It is a very popular story. In fact, one of the few things that can match and even exceed the popularity of the Lord of the Rings franchise is – you guessed it – the game of chess. Given the immense popularity of these two things, it makes total sense that they would eventually be combined. In 2019, you can buy Lord of the Rings themed versions of tons of classic board games including Monopoly, so why shouldn’t you be able to combine your love of LOTR and chess all on one board? Luckily, you can, with a Lord of the Rings Themed Chess Set. The first thing you’ll need to consider is the material that the LOTR chess set is made out of. Some materials are more durable and long lasting than others, which is an important factor, but you’ll also want to consider any special care or continued maintenance that chess sets made from certain materials might need. Metal pieces will last longer than cheap plastic ones, but they may also need to be cleaned in a special way with a particular cleaner if they get dirty. These are all things to consider when choosing a material for your LOTR chess set. Though these Lord of the Rings chess sets all share a common theme, you may be surprised at the variations in style that are possible within those constraints. Certain chess sets are instantly recognizable as LOTR themed sets, while others are more subtle with a traditional style, and it would take a closer look to determine that they’re themed around Lord of the Rings. This chess set is one of the style where it’s very plain to see that it’s Lord of the Rings themed. It is truly a must have collector’s item for fans of the books or movies. This particular LOTR chess set is probably more suited to fans of the movies, however, since the pieces are each closely modeled after the characters as portrayed in the films. This LOTR Collector’s Chess Set is one of the most well-made and impressive chess sets in any category. It stands alone as a masterpiece of luxury chess products; it’s certainly not just a cheaply made gimmick as some themed chess sets can be. It is crafted from high quality materials like glass, porcelain, and pewter, and it has a high end design aesthetic as evidenced by the highly detailed, true to life chess pieces. Speaking of the LOTR chess set pieces, they are each modeled after characters from the Lord of the Rings and The Hobbit movies and cast in fine pewter. Each piece stands between 2 and 3 inches tall, and they all bear a striking resemblance to the actors that portray each character in the movies. You and your friends will surely be impressed! Some of the characters represented on the board include Arwen, Aragorn, Gandalf, Galadriel, Boromir, Frodo, Sam, Merry and Pippin on White’s side and four different orcs, a cave troll, Orthanc Tower, Uruk-hai, Saruman, Lurtz, and a Ringwraith on Black’s side. Pieces are distinguished by a colored ring around the bottom of each piece – green for the heroes and purple for the villains. The chessboard measures 15 inches square and 4.5 inches deep. It is made entirely out of cold cast porcelain with a protective plexiglass top to prevent damage to the playing surface over time. The board includes slots along its perimeter where all the pieces can be stored when not in use, but they’ll still be on display! 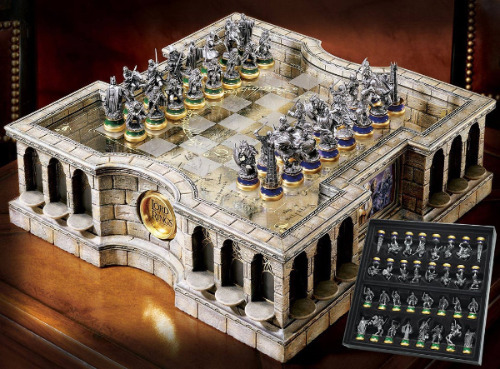 This Lord of The Rings chess set also includes a separate storage box with padded coffers for each piece, as well as a map of Middle Earth mounted below the playing surface. The pieces can be stored when not in use, but they’ll still be on display! 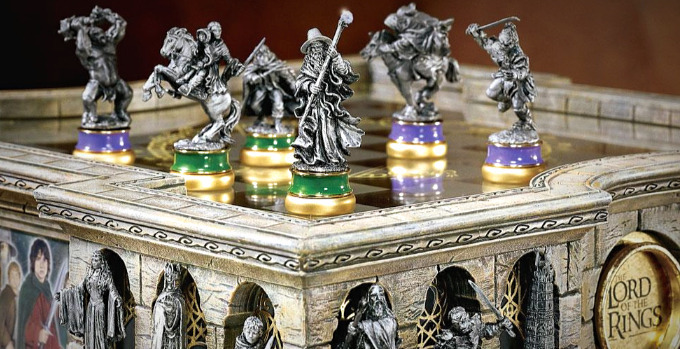 This is a high quality Lord of the Rings themed chess set with a beautiful traditional style. It’s such a classic design that you may not even realize at first glance that you’re looking at a Lord of the Rings themed chess set. Upon closer inspection, though, you’ll realize that each of the pieces is modeled after a beloved character from the Lord of the Rings movies, and in fact, all of the pieces are currently facing off for an epic final stand, as in the Great War of the Ring. All 32 chess pieces included in The Battle for Middle Earth Chess Set were meticulously designed and crafted with the utmost attention to detail. They are made from a metallic resin that is then hand painted to an exquisite level of detail. Each character’s likeness, costume, and weaponry are exact reproductions of those in the films, right down to the tiniest little detail. The artists were so determined to get these pieces right that they had each one approved both by New Line Cinema and the individual actors who portrayed each character. Now that’s dedication to producing a high quality product! Some of the characters included in this Lord of The Rings chess set are Gandalf, Legolas, Gimli, Aragorn, Frodo, Sam, Merry, Pippin, Sauron, Gollum, and many others. The chessboard features a map of Middle Earth etched onto the playing surface. The board itself is plastic, but its luxury styling means that most people would never even know at a glance. 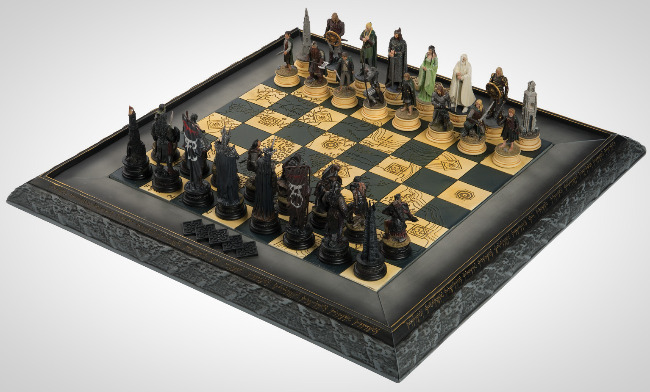 The molded edges and dark coloration of the board give The Battle for Middle Earth chess set a sophisticated look that make it the perfect battleground for a battle between the forces of good and the forces of evil. When it comes to a LOTR & The Hobbit chess sets, you might think that your options would be limited in 2019, so many years after the books and even the movies first came out. But you would be surprised! Interest in the Lord of the Rings series is still quite high, even so, many years after its release. Therefore, it’s pretty easy to find a themed chess set featuring the Lord of the Rings characters. The issue you might run into is quality more than quantity. It’s pretty easy to find a themed chess set featuring the Lord of the Rings characters. The issue you might run into is quality more than quantity. We’ve touched on this before, but the materials that your chess set are made of are very indicative of its overall quality. High quality materials will usually result in a high-quality chess set, while lower quality materials will limit the overall quality of the chess set. Cheaper materials like plastic may negatively affect the luxuriousness of the set, while porcelain can elevate the whole set to another level. When it comes to style, there is a wide variety available in Lord of the Rings & The Hobbit chess sets. You can choose something over the top in terms of “Middle Earthiness” or something more subtle that just looks like a regular chess set at first glance. Of course, there are also plenty of options in between those two extremes. Choose whatever style you prefer. Price is always a limiting factor for anyone who’s on a budget. Your preferred price point is also likely to influence the quality of materials you’re able to afford in your LOTR chess set. Some of these Lord of the Rings themed chess sets are total works of art and have a price that reflects that. After all is said and done, any one of The Lord of the Rings chess sets on our list would be a great addition to your home or office, provided that they fit within your budget. You really can’t go wrong with any of these choices. They are each works of art in their own right that accurately capture the likenesses of the beloved characters in the Lord of the Rings and The Hobbit movies, and your friends and family will be quite impressed when they get a look at them!